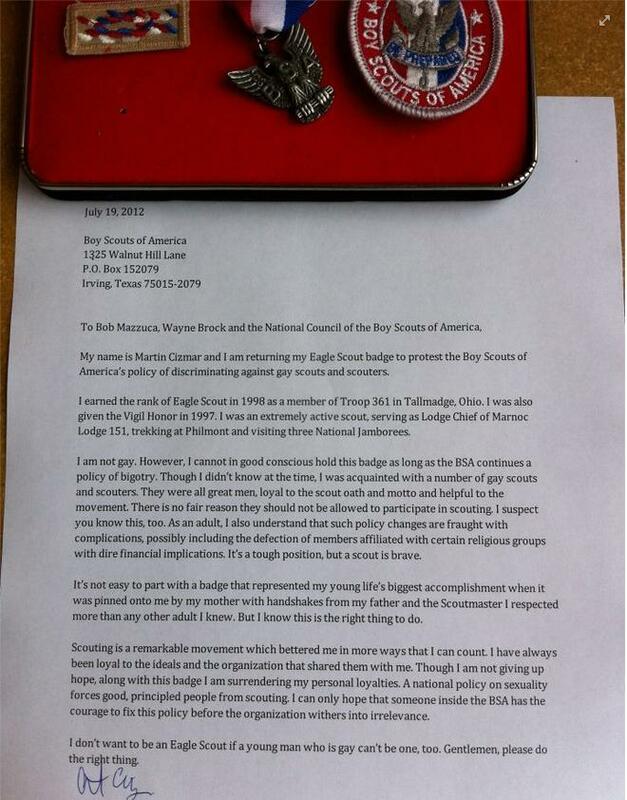 After a 2-year review the Boy Scouts of America reaffirmed its ban on gays saying, “this policy is absolutely the best policy for the Boy Scouts.” In response, an Eagle Scout pens a letter of disapproval and encloses his Eagle Scout Badge. Below is the transcript along with a photo of the letter and badge. To Bob Mazzuca, Wayne Brock and the National Council of the Boy Scouts of America. My name is Martin Cizmar and I am returning my Eagle Scout badge to protest the Boy Scouts of America’s policy of discriminating against gay scouts and scouters. 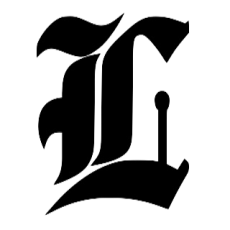 I earned the rank of Eagle Scout in 1998 as a member of Troop 361 in Tallmadge, Ohio. I was also given the Vigil Honor in 1997. I was an extremely active scout, serving as Lodge Chief of Marnoc Lodge 151, trekking at Philmont and visiting three National Jamborees. I am not gay. However, I cannot in good conscious hold this badge as long as the BSA continues a policy of bigotry. Though I didn’t know at the time, I was acquainted with a number of gay scouts and scouters. They were all great men, loyal to the scout oath and motto and helpful to the movement. There is no fair reason they should not be allowed to participate in scouting. I suspect you know this, too. As an adult, I also understand that such policy changes are fraught with complications, possibly including the defection of members affiliated with certain religious groups with dire financial implications. It’s a tough position, but a scout is brave. It’s not easy to part with a badge that represented my young life’s biggest accomplishment when it was pinned onto me by my mother with handshakes from my father and the Scoutmaster I respected more than any other adult I knew. But I know this is the right thing to do. Scouting is a remarkable movement which bettered me in more ways that I can count. I have always been loyal to the ideals and the organization that shared them with me. Though I am not giving up hope, along with this badge I am surrendering my personal loyalties. A national policy on sexuality forces good, principled people from scouting. I can only hope that someone inside the BSA has the courage to fix this policy before the organization withers into irrelevance. I don’t want to be an Eagle Scout if a young man who is gay can’t be one too. Gentlemen, please do the right thing.